Anatoly Evgenievich Karpov was born in Zlatoust, Russia in 1951. He was taught the moves of chess when he was 4. At the age of 15 he became one of the youngest Soviet players ever to gain the title of National Master. In April 1975, a few days before his 24th birthday FIDE declared him the World Champion after Bobby Fischer, the current World Champion, refused to defend his title. 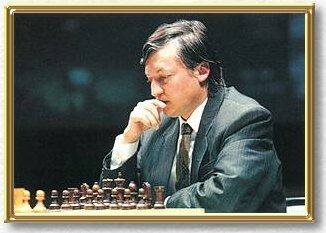 Karpov was embarrassed that he had acquired the title in this manner and subsequently played in many strong tournaments to prove that he deserved to be World Champion. He performed impressively and accumulated the finest tournament record in history. He once said, "To be champion requires more than simply being a strong player; one has to	be a strong human being as well." He retained his title until losing to Garry Kasparov in a controversial match in 1985. In 1993 Kasparov rejected FIDE leaving Karpov to play in the official FIDE World Championship match in which he defeated Jan Timman of the Netherlands. However, his victory was over-shadowed by the independent championship match played at the same time between the current World Champion, Kasparov and British Grandmaster,	Nigel Short. Both Karpov and Kasparov won their championship matches and both claim the title of World	Champion. His style of play is positional. He describes his	game philosophy as follows: "Let us say the game may be continued in two ways: one of them is a beautiful tactical blow that gives rise to variations that don't yield to precise calculation; the other is clear positional pressure that leads to an endgame with microscopic chances of victory.... I would choose the latter without thinking twice. If the opponent offers keen play I don't object; but in such cases I get less satisfaction, even if I win, than from a game conducted according to all the rules of strategy with its ruthless logic."